Onyx has started accepting a 2nd round of pre-orders for the new 10.3-inch Onyx Boox Note Pro. They’re selling it for $599 directly from their Boox Shop website. Estimated shipping is listed at 15-30 days out, so it’ll be at least 2-4 weeks before they start to arrive. Unfortunately they still haven’t listed the Note Pro on the Onyx Amazon store yet. They don’t seem to do pre-orders there for some reason, but it should get listed on Amazon later this month. The 10.3-inch Onyx Boox Note Pro is basically a larger version of the 7.8-inch Nova Pro that was just released, and it’s just like the Note Plus with the flush glass screen that was released last fall, except they added a frontlight and doubled the storage space and RAM to 64GB and 4GB. Like the original Note, the Note Pro runs Android 6.0 and has a quad-core 1.6GHz processor, a Wacom touchscreen, a capacitive touchscreen, a USB-C port, Wi-Fi and Bluetooth. For those that would rather buy it from Amazon with Prime shipping and easy returns, I’ll let you know with a future article as soon as it becomes available to order from there. Either way it’s good to see they are getting closer to the official release. Some folks have already gotten their early pre-orders. It’s interesting. But the same 227 ppi. And cost almost like 13’3 Max. Thank you. Probably later this month. I already have the regular Note so there will be no learning curve so I’ll basically just be reviewing the frontlight and the screen with the added glass layer. The 13.3-inch Boox model is the only one with an HDMI port. There’s also another company called Dasung that makes E Ink monitors with HDMI ports but they are super expensive, even their 7.8-inch Not eReader is pretty pricey. Gotcha. 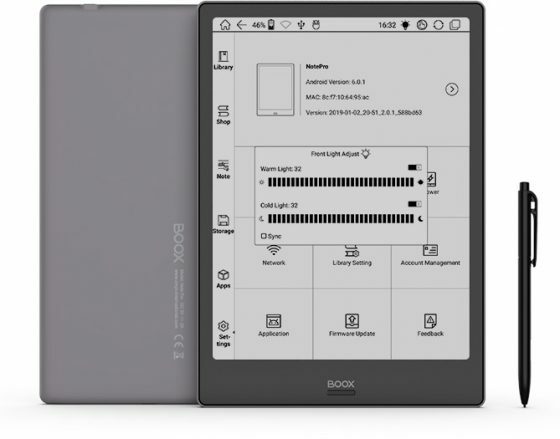 Given how quickly (generally) Boox refreshes their product lines would it make more sense to sit back and wait for a newer version of their 13.3” model? The only thing it lacks is a frontlight. The software and specs are the same as the current models. There hasn’t been anything to suggest they’re planning on releasing a frontlit model, but they do have a history of releasing new models frequently. They did just release the Max2 Pro a few months back though so that might be it all for awhile. Hello Nathan, I already got a Note Pro, I live in Belgium and bought it on Bol.com. I like it a lot but I have a problem with the Charis Sil Modified Larger font that I sideloaded: the space between the lines is very big, even with the smallest possible setting. Do you have that problem also with your Nova Pro? Yeah, same here. I don’t know what’s up with that. I got used to using the noto serif font instead. Thanks for this feedback Nathan . I wil try that font out. What boldness and contrast settings do you use with that font (to get it as sharp as possible)? The new firmware doesn’t have numbers for the settings; I just have it set one or two notches from the left. As info I ended up ordering the Note Pro direct from Boox (they had a promo including several accessories) over the weekend and just got notification it shipped today. I looked at the Mimas as well but decided to go this route. Can’t wait to muck with it!